Print 107 from “One Hundred Views of Famous Places in Edo”. From the perspective of an eagle’s eye we look out over flat marshland towards the silhouette of Mount Tsukuba on the horizon. Until the end of the Edo period, the point of land (susaki) called Fukagawa Susaki was on the eastern side of Edo Bay, it now lies in the middle of Tōkyō. 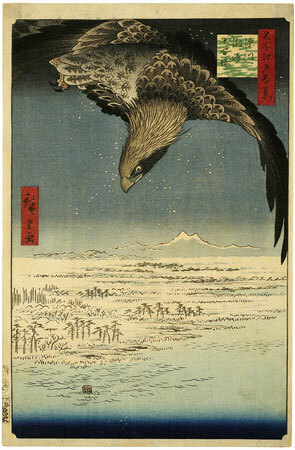 This masterful print is particularly impressive in the manner in which it creates a contrast between the powerful, all-seeing eagle, just about to pounce on its prey, and the disheartening expanse of the winter plane. The desolate area along the edge of Edo Bay on the eastern edge of Edo was known as the “Thousand Fields of the Eitai Coast”. Tsubo was a measure of land, and the area also became known as the “Ten Thousand Tsubo”. The cartouche on this impression is printed in green and yellow, usually the sign of a later impression, and the sky block is slightly out of register at the top of the signature cartouche. In spite of this, the impression seems at least as good as those reproduced by Shigeo Miyao in Ukiyoe Taikei, which is considered to be the finest set in Japan, and the one reproduced by Ledoux (Hokusai to Hiroshige, no. 49). Like those, this impression has mica on the dark tips of the wings and shiny tips on the claws which could be surface-polishing, black ink with animal glue as a binder, or lacquer, as it is usually described. The cartouche has an embossed pattern like a mesh of cloth over the colours. Indeed, this impression may be slightly better than either Miyao’s or Ledoux’s, because it seems to lack any blemishes on the dark block of the eagle’s feathers at the upper left or middle right, and the break on the outline of the leftmost slope of Mt. Tsukuba in the distance seems smaller in the Riese impression than in either of the other two. The finest impression I have seen of this print, however, is in the Lord Marks album in London. To my recollection, even the beak of the eagle is printed with lacquer, and the overprinting on his feathers is even more subtle and impressive than it is here. One might add that the woodgrain in the sky which is so conspicuous in this and other impressions, largely disappears in later ones.